Freshmen Anna DeJonge and Molly Walters took on closing the accessibility gap at The Grove Museum as a part of their undergraduate research project. When people with visual disabilities or autism visit a museum, how can the venue be more accessible and welcoming? 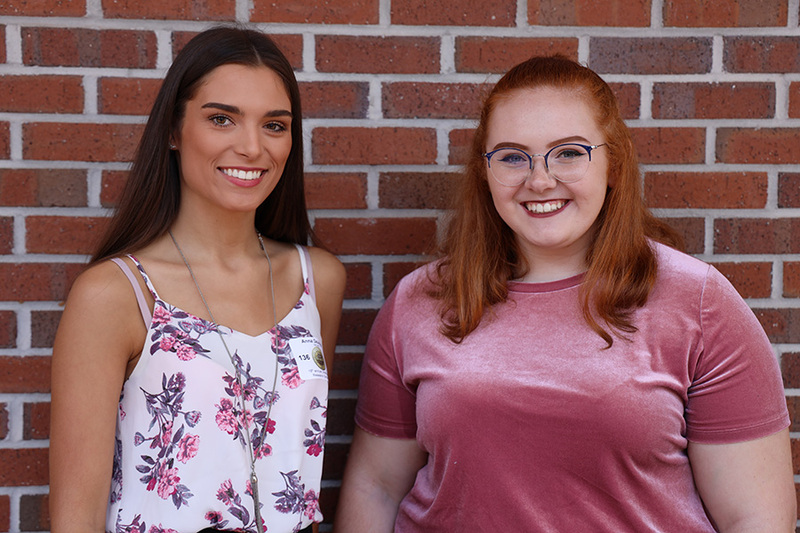 That’s what Florida State University freshmen Anna DeJonge and Molly Walters set out to explore through a project they conducted with the Undergraduate Research Opportunity Program (UROP) this year. DeJonge and Walters were among the more than 400 Florida State students who presented their research April 2 at the Undergraduate Research Symposium. Undergraduate research gives students the opportunity to become better thinkers and innovators while solving real-world problems. While the majority of students work with faculty mentors on projects, UROP has expanded research opportunities by partnering with community organizations. DeJonge and Walters worked with The Grove Museum, a local Tallahassee museum charged with preserving and interpreting the Call-Collins House, its surrounding acreage, and its historical collections, in order to engage the public in dialogue about civil rights and American history. DeJonge and Walters’ research focused on making the museum’s content more accessible for audience members on the autism spectrum and for those with visual disabilities. Teaming up with The Grove Museum was a win-win for the museum and the researchers. DeJonge, who is majoring in creative writing and communications, authored an audio tour for people with visual disabilities. “Some blind people don’t go to museums because they aren’t accessible to them, and that’s unfortunate because they have great art and history,” DeJonge said. The audio tour is very directional and takes visitors counterclockwise throughout the house. It includes detailed explanations and descriptions of paintings, artifacts and inscriptions of the plaques. DeJonge researched every word of the tour to make sure it was appropriate for this very specific audience. Walters, a Presidential Scholar majoring in studio art, researched low-budget ways to increase accessibility for individuals with autism at smaller-scale museums. She said the most crucial part of the project was reaching out to the population to ask what their needs are. “It’s one of the most important things that people can do, but forget to,” Walters said. Walters worked with Fernandez to implement small, but impactful accommodations at The Grove Museum, such as acquiring noise-canceling headphones and sunglasses to mitigate overstimulation of the senses and creating a social narrative modeled after The Ringling. “The social narrative walks you through the visit so you know what’s going to happen when you enter the museum and when there’s anything that can be potentially overstimulating, it gives you a forewarning,” Walters said. Walters said that as an art major, it was difficult for her to picture what research looks like outside of a laboratory setting. “That’s why I think projects like this one are so important — so that people know that research isn’t restricted to a specific field of study,” Walters said. Young said the CRE anticipates continuing to expand these crucial community partnerships. “Students gain essential research skills while also learning more about Tallahassee beyond FSU’s campus, and organizations gain enthusiastic assistance — at no cost — on projects that contribute to their missions and extend their scope,” she said. For more information on the 2019 Undergraduate Research Symposium, visit https://cre.fsu.edu/events/undergraduate-research-symposium.